Palmers Tummy Butter Discounts Apply ! Keeping your skin supple as your tummy grows during pregnancy is essential to reducing the chance, or degree, of stretch marks. Tummy Butter is widely recommended for treatment of stretch marks before and after pregnancy. Palmer's Tummy Butter is made of a concentrated formula of Cocoa Butter, Vitamin E, Collagen, Elastin and soothing Lavender Oil. 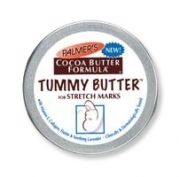 Palmer's Tummy Butter massages into the skin to help restore vital moisture, smooth stretch marks and tone skin. Tummy Butter is also very soothing when your tummy feels dry or itchy, which is a common complaint among pregnant women.